OneVault manages healthcare compliance by demonstrating your organisation's adherence to standards, laws, regulations, guidelines and specifications relevant to its healthcare sector. OneVault supports organisations to reduce their risk of violations and non compliance. OneVault has a number of compliance, audit and other documents ready for adoption and edit to suit your organisation. 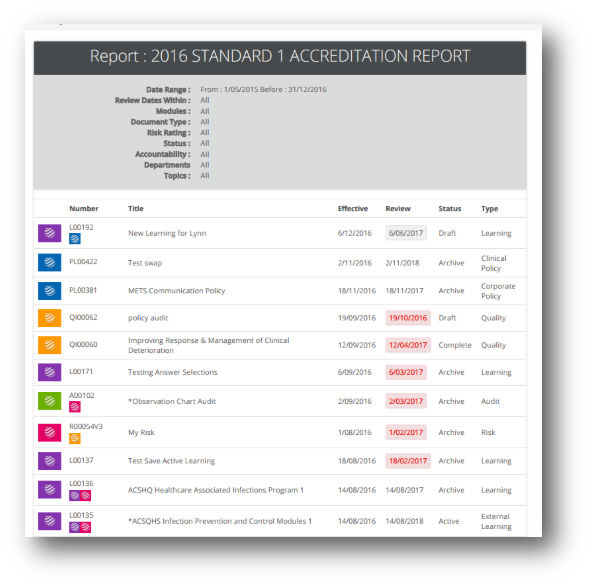 OneVault collates data from across the system to demonstrate compliance. All reports are in real time and can be tailored as necessary. Provide regulators view only system access to gain feedback and fix problems prior to onsite survey. Customise your lists and selections to collect data against your relevant healthcare sector standards. OneVault ensures your settings are optimised to support your business however, if you require on-site consulting services, we can suggest several independent consultants who can support your organisation with accreditation | certification and compliance services.